Denison Yachting will be featuring a 2018 Fountaine Pajot 40 catamaran and a custom built 1990 78′ Sharp Design Yachtfisher at this year’s San Diego International Boat Show. With catamarans in great demand, now is the time to reserve your production slot for a new one. 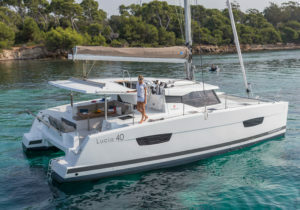 Come see us at the show and we’ll give you information on the Fountaine Pajot and Seawind range of cats, along with details on the two catamarans we have on order, a 2019 Fountaine Pajot Saona 47 and a Fountaine Pajot MY44 Power Cat. For monohull sailors, we are proud to announce that we have 4 new Dufour sailing yachts on order, with two of them scheduled for September 2018 deliveries. If you’re shopping for a sailboat and you haven’t made your final selection, now is the time to learn more about these stellar Dufours. Built in France, Dufours are renowned for their excellent quality, ergonomic features and superb sailing performance. Also coming soon to the west coast: a Dufour 360, Dufour 412, Dufour 460 and a Dufour 520. If you’d like us to send you information on any of our new boats, please contact one of our seasoned yacht brokers at (619) 822.2715. We’ll see you at the show!